I finished a sweater! For once, eh? I am not wild about the edges, as they are thicker than I would like due to encasing the seam- I finished this on the boat, where there was no sewing machine for steeking! 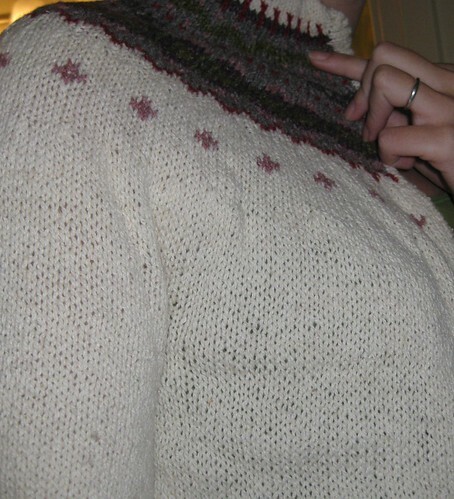 The yoke is actually a bit big for me as well- the entire sweater is about 2 inches wider than intended. It might become my mom's, as it fits her even better than me. I did button holes that go through both sides of the picot border. Unfortunately, as the camera is currently dead and the old camera I am using now doesn't do close ups well, none of the picturs of that turned out! I haven't put buttons on yet since it looks nice just hanging open. 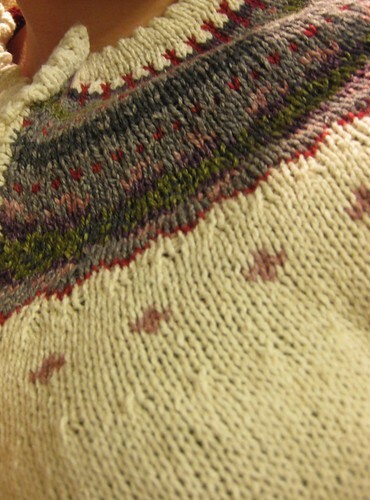 I swear it isn't actually puckered at the yoke, it just hasn't been totally blocked yet.